1. The weekend started out witha drive down to my hometown, making no stops whatsoever. Total time, about 4 hours, exactly one tank of gas. Total time there? 25 hours. 2. Yes, I’m a southern boy. How can you tell? Why, not three hours after I’ve arrived, I’m sippin’ on gin and juice (with my mind on my money and my money on my mind) reliving all of the good times. Eventually, though, even I can’t take that much gin, and eventually have to pour the rest down the drain. Drinking and driving don’t mix, trust me. 3. Note to all the people with iPagers: they don’t work in Southern Alabama. The solution – emails through and conversations on the cellular phone. Yes, you too can stand outside and coordinate work efforts from another state. You gotta love it. 4. I hang out with the family, who are all preparing for the funeral the next day. “Remember when” conversations fill the air, and smiles, not tears, are everpresent. 5. Four hours later, I trek on down to Angelica’s house, but you know I gotta wait around ’til she gets there, because my godsons have never met me. Once she’s there, though, it’s on! We would probably have done a whole lot better had there been a bar around, though. You too can spend time just listening to music, jumping to blogsites, and getting into the spirit of why we blog in the first place: to clear our head. 6. On Saturday morning, most people have breakfast and hang with the kids. I do the changeover: I put on the suit and tie and meet old high school friends along the way, and any euphoria I had is tempered with the fact that in about eight months, I’ll be having a 20 year high school reunion. 7. Congregating at our uncle’s house to get ready for the funeral procession I’m around people I see once a month, yet I also see some people I haven’t seen in 20+ years. 8. Saturday afternoon with the family is tinged with both pain and humor. Don’t remember the last time I shed tears. There’s a collective dissention, however. How are you possibly going to have dinner served to us with exactly one piece of chicken, bland vegetables, and 4 ounces of punch? In the south? C’mon. I’m just sayin’. 9. During the rainy Saturday afternoon, I go and hang out with one of my high school friends who lets me know that he considers us closer than we’ve ever been. My SUV agrees with him, and while backing up to make a U-turn, my SUV finds its way into a ditch, as seen above. 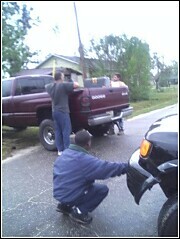 It takes a truck, a chain, 4 people, and a whole lotta mud to get it out of the ditch. Through the rain, I return home to decompress and get ready for the rest of the weekend. 10. Sunday, even though it was a rainy day, I burned two CDs for one of the Atlanta bloggers, and I went and made my way over to the coffee shop. After about an hour, I don’t see any of the bloggers I look around but I do get to meet Anthony David (note to self: blog more on exponent). After telling him about blogs, and explaining how irritated I am about being the only one here that was on the email list, I hear someone behind me saying, “You’re not the only one here. I’m here too.” I look behind me, and who’s there? Saga! 11. Sitting there for about 30 minutes with a beautiful, humorous, and really interesting lady made up for the hour spent waiting. Seeing as we were the only two that we were there (where were the rest of y’all? ), we decide on two things: that we’ll have to make sure that commmication improves, and that I set up the second Atlanta black bloggers event. Oh my! I’m glad you were okay. And hopefully more ATL bloggers show up next time. I wonder what kinda of excuses you’ll receive as to why they didn’t show up. My excuse? Hmm… Basically, I didn’t feel like being an Atlanta “black blogger”. I may post more about that later. ROFLMAO…not to name names right??? Well what’s bad is that I COULD have come… I swear I totally forgot about it. Ms Thing called me and EVERYTHING to ask me where it was located and I swear even then, I was vegging. wow – I really didn’t know, my bad. Glad you made it out regardless, it was a pleasure. “…Why we blog in the first place…” I liked that…. you know lis is right…you do have a way of seeing the brightness in most everything. what an admirable trait.